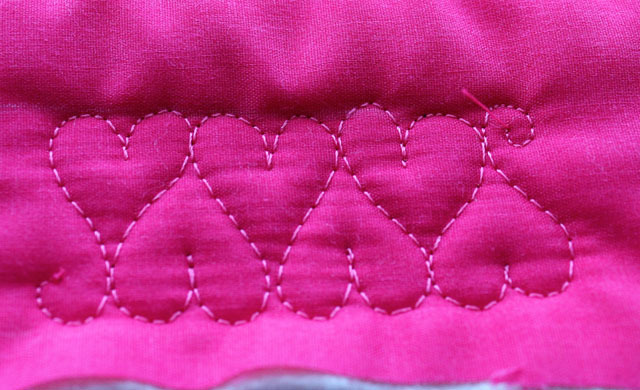 Today’s motif is the Sweetheart Border. 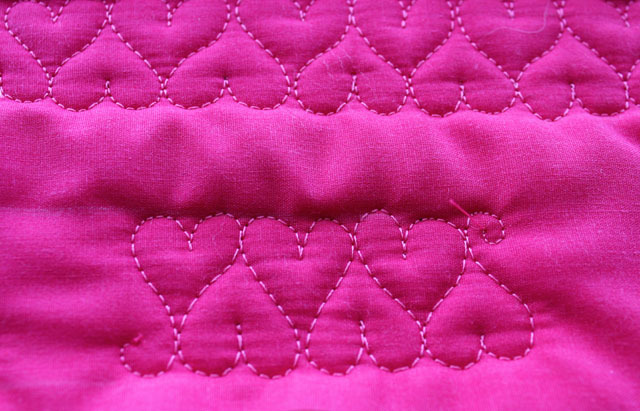 It is fun to use for Valentine’s Day, but it looks great as a border on any “girlie” quilts. I like to start by drawing two parallel lines to serve as guidelines or “rails”. 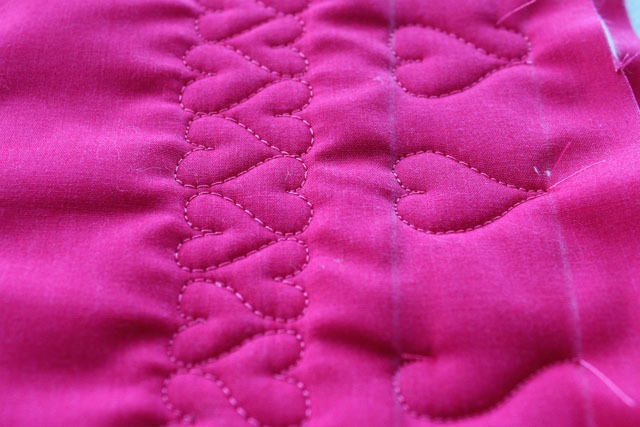 For this tutorial, the rails are one inch apart, but any size that suits your quilt will work. Starting on the bottom rail, curve up and to left, then circle around toward the top and back down again. 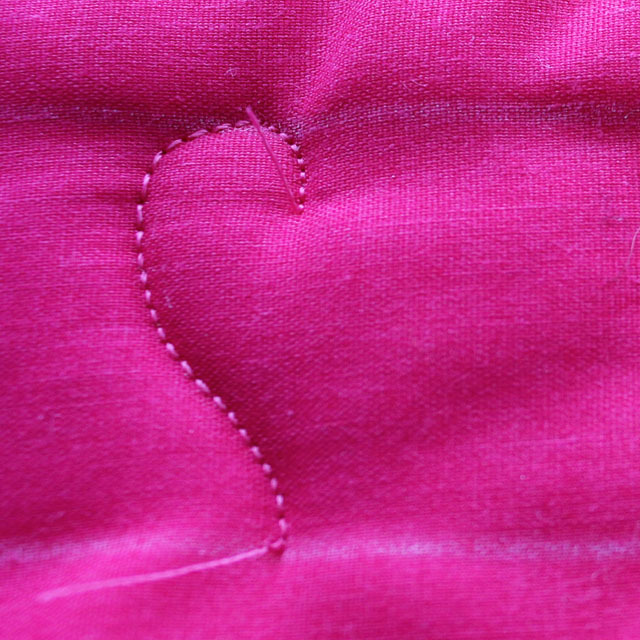 This is the left side of your first heart. 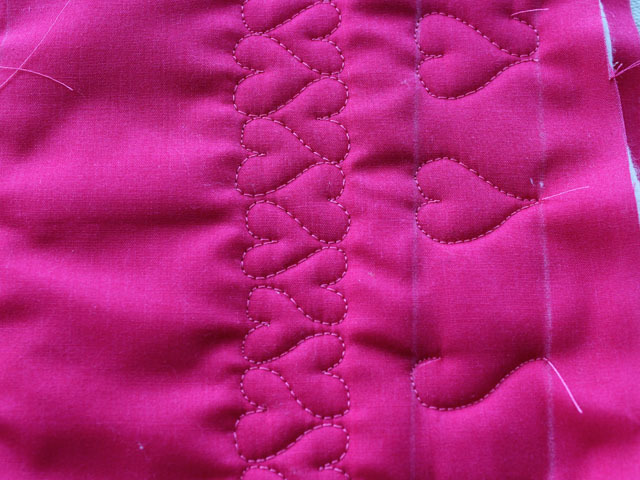 Stitch back down again, trying to mirror the left side of your motif. 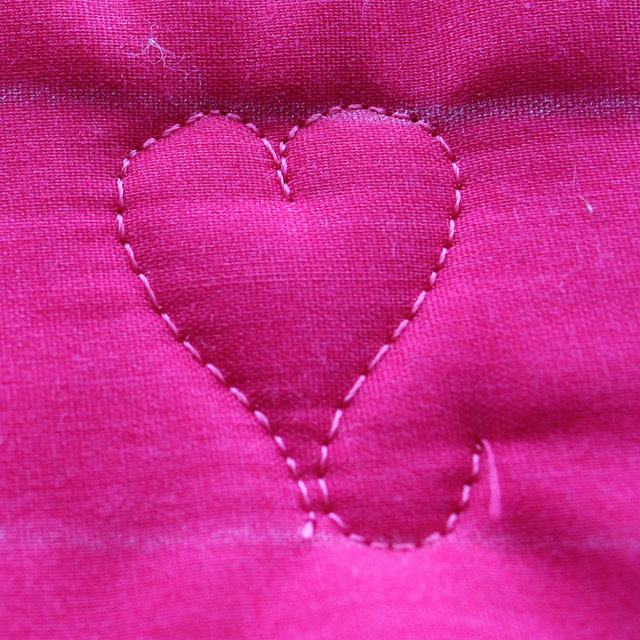 Do not worry if it’s not perfect–that’s what gives free motion quilting it’s character–it is not machine perfect! And you are ready to go again! Once you develop a rhythm, you will finish an entire row in a heartbeat! I hope you will LUV this pattern as much as I do! Beautiful! 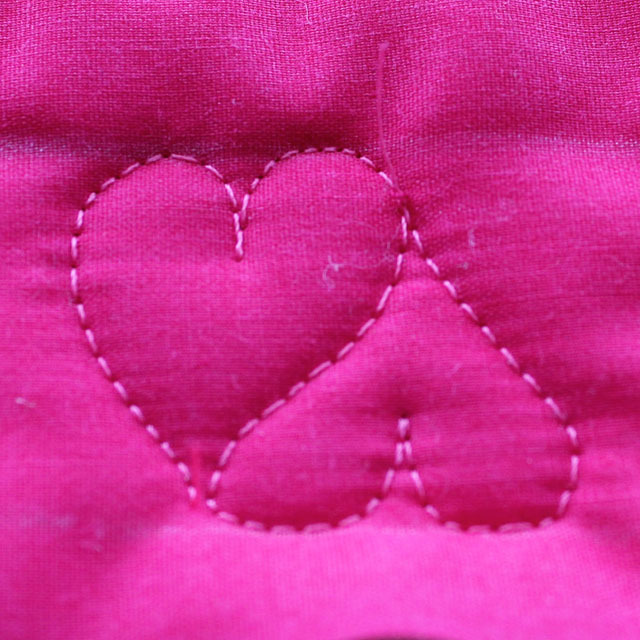 LOVE your beautiful quilts and photos! Wow! You make it look so easy. I will have to try this. Won’t be in the near future though. Taking notes for use later. Totally love this! Thank you! I can’t wait to give it a try. It looks lovely. Great photos to explain it all! This is such a sweet design for little girls. I just received my first kit from Quilts For Kids, and it’s a girlie quilt and I think this would be perfect for the border. The pattern is a plain 4-Patch, but the fabrics are CUTE. In the solid blocks I plan to do a flower motif, and maybe an echoed heart in the print blocks. 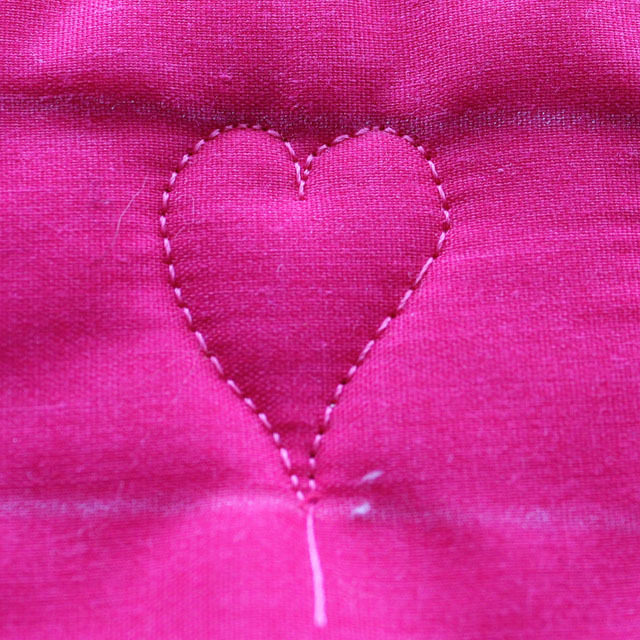 My new computerized Singer has over 200 decorative stitches, and I may use some of those in matching colors for the connecting lines of the blocks to ‘jazz it up’ some. All of our quilts go to Children’s of Alabama, here in Birmingham, and I want to make it as pretty as possible. Although I’ve made quilts for years, I am just learning to do free motion stitching, and this will be my first actual quilt to try out the skills I have been practicing for the past couple of months (paper, then small sandwiches). Thanks so much for your sharing. I love your site!